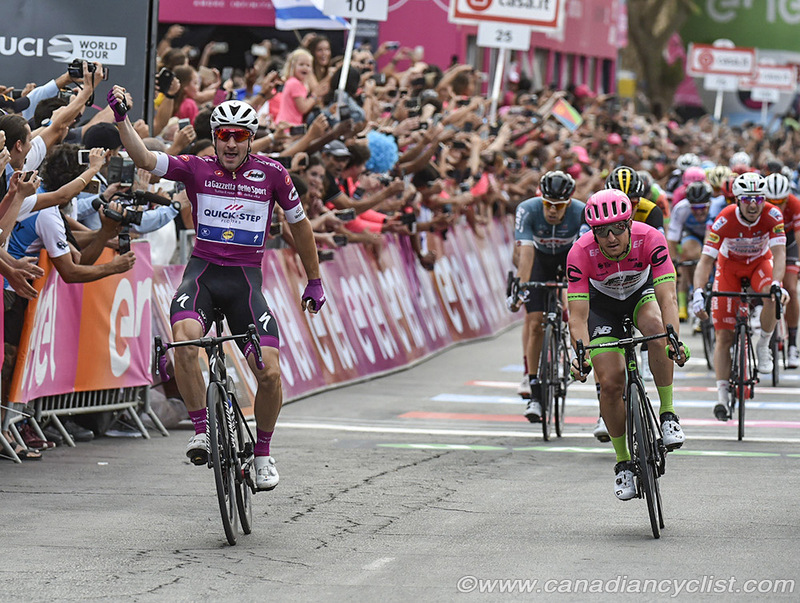 In many ways, Stage 3 of the Giro in Israel was remarkably similar to Stage 2 - Rohan Dennis (BMC) stayed in the pink jersey of race leader, Elia Viviani (Quick Step) won his second straight stage in a field sprint, and Canada's Guillaume Boivin (Israel Cycling Academy) went out on a race-long breakaway. 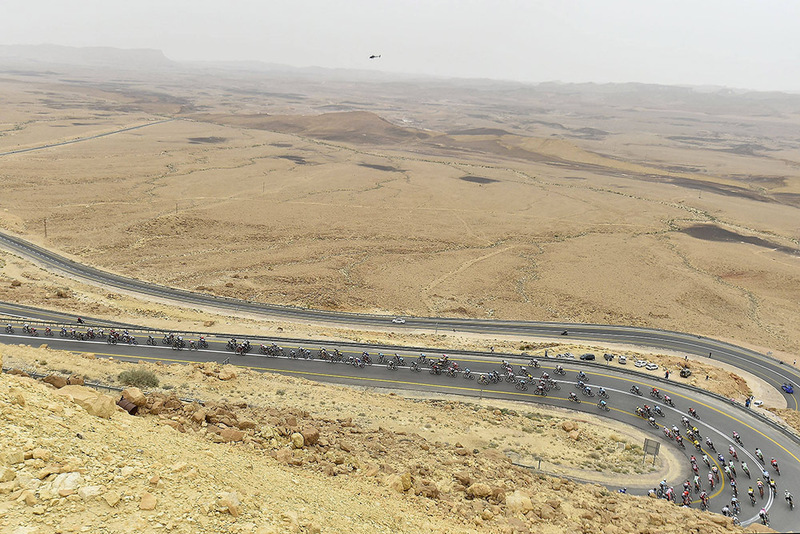 At 229 kilometres, from Be'er Sheva to the southern tip of Israel in Eilat on the Red Sea, the stage took riders through the incredible and sparse terrain of the Negev Desert, where tailwinds pushed the speed to 70 kilometres an hour as they chased three breakaways. Boivin, Marco Frapporti (Androni Giocattoli-Sidermec) and Enrico Barbin (Bardiani-CSF) went clear almost from the drop of the flag signaling the end of the neutral start. Barbin led Boivin in the KoM standings by a single point after the previous stage, and the duo were clearly out front to battle for the Jersey on the single categorized climb, 127 kilometres into the race. The gap quickly went to over seven minutes before Dennis' BMC team went to the front to pull it back into reasonable range. The race entered the desert at the Ramon Crater, a stunning corkscrew descent into the flat desert - where Boivin was recorded at 89 kilometres per hour. As the riders exited the Crater they hit the only climb of the day, with Frapporti jumping away to take maximum points and Barbin finishing ahead of Boivin to extend his lead to five points, with Boivin and Frapporti at three apiece. The gap was still over four minutes with 80 kilometres to go, and it came down very slowly, with the break still a minute clear with 20 kilometres remaining. However, the sprint trains were getting organized, and the catch was made with just over five kilometres to go. "This is the stage I had in mind when we came to Israel," said Boivin, "because I know this road from a training camp we had here two years ago and it's always a massive tailwind coming off that downhill with about 50 kilometres to go. So I figured there was a small chance the bunch could miscalculate it, because you cannot ride 100 K an hour - we were riding 70 K an hour in the front [and] you can only go so fast. That was the one I wanted to be in, but it would have been better with more than three guys. There was still a bit of panic in the pack to try to catch us, but they reeled us back with about 5 K to go. I had a bit of hope in the last 15 K when we were keeping the gap steady, but then we lost one guy and we were on the limit, so the collaboration wasn't as good as it had been. We didn't have the legs as a group to make it to the finish; maybe with a stronger group." Going after the KoM Jersey "was part if my plan, but Barbin was on my wheel and with the other guy [Frapporti] ... there was nothing to do." Boivin, also feels that the team has proved that they deserve to be in the Giro. "From a breakaway standpoint, I think so. Today we had a guy up front and the bunch had to push really hard to get us back, so that shows the strength of the team we have. We are in this race as much as any other team." 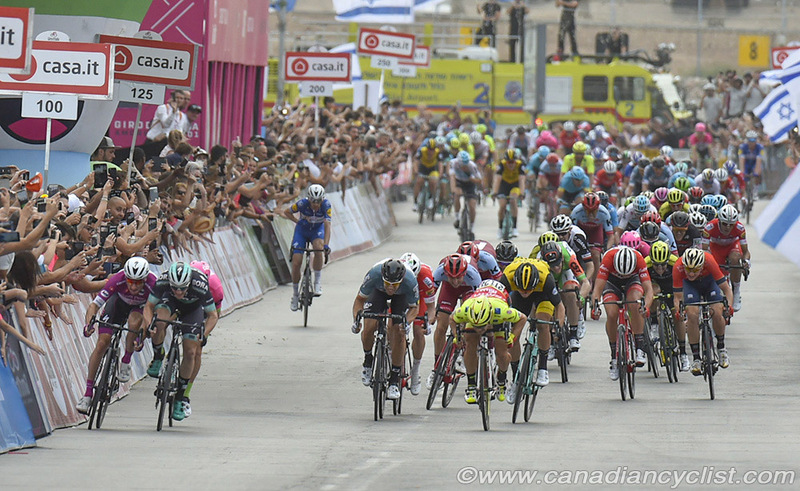 Sam Bennett (BORA-hansgrohe) led out the sprint on the right side, and tried to shut the door on Viviani in the final 100 metres, but the Italian was able to push his way through to easily win. Sacha Modolo (EF Education First-Drapac) was second, followed by Bennett. Dennis still leads defending champion and Stage 1 winner Tom Dumoulin (Team Sunweb) by one second, but third placed Victor Campenaerts (Lotto Fix All) lost time in the final kilometres, putting José Gonçalves (Katusha-Alpecin) up to third. Mike Woods (EF Education First Drapac Cannondale) finished 14th, with the lead group, and remains 1:01 back. Boivin leads the Intermediate Sprint classification, is second in the Combativity classification (behind Viviani), third in the KoM standings and fifth in Points. "It was very stressful today," admitted Dennis, "but I'm glad it's done. It was a hard day, it was long, and we were somewhat lucky that it was a tailwind. The wind was very strong. The last 40 or 50 kilometres, when we were chasing the breakaway and especially the last 20 kilometres, we were sitting on 70 kilometres an hour so we couldn't go any faster. It was super fast and we were lucky that it wasn't a crosswind. Once again, the team did a great job and kept me up the front." Racing resumes Tuesday in Sicily after a transfer day. - A group of journalists ahead of the race stopped at a resort to check out the entrance to the Ramon Crater. Walking in, we did a double take to see Lance Armstrong sitting in the lounge. As people prepared to pull out cellphones, Armstrong quickly got up and left the room.